What is the Best Spice Rack? After a lot of research and reflection, we chose the YouCopia SpiceStack as our editor pick. The YouCopia Chef’s Edition SpiceStack 30 Bottle Spice Organizer that fits in cabinets and on counters. Affordable and attractive, the YouCopia SpiceStack can fit up to 60 half bottles of spice and up to 30 half bottles of spice. When you need them, you pull out the drawer (which drops down) and you can see everything you need. A lot of people have mix-and-match spices and they aren’t interested in creating a more uniform look. The YouCopia SpiceStack provides a clean, modern appearance even if you have old spices, spices in random jars and so forth: it instantly organizes and elevates your spice cabinet, without having to worry about putting things in cleaner, more consistent jars. It also comes with labels. Choosing the right spice rack depends on how you want to organize and categorize your spices. And it’s important. If you cook a lot, you need easy access to all of the spices in your kitchen… and you certainly don’t want to be fiddling with and sorting through bottles when something is sizzling. Spice racks can be on the counter, in cabinet or on the wall: it all depends on where you have space in your kitchen. You should choose your spice rack location based on where will be easiest for you. This can be a big deal. Some spice racks show the tops of your bottles (caps) and the others show the side. This depends entirely on how you best organize your spices. Some spice racks come with bottles, creating a uniform and attractive appearance (though they are more expensive and it means you need to refill the bottles). Other spice racks are designed to work with any standard bottle. Spice racks can range from a few dollars to a few hundred dollars, depending on the amount of spices that you’re using and the materials involved. A simple, no frills spice rack is very cheap, but a large modern rack that comes with the spices included is going to cost you. If you use your spices a lot and if your spice rack has moving parts, then you need to find an option that has solid durability ratings. On the other hand, if your spice rack is mostly for decor, you may not care. Spice racks come in metal, plastic and wood, which can impact both cost and utility. Metal tends to be far more durable, but it can rust over time if not properly treated. Plastic is less durable, but it’s cheaper. Wood is a good blend between durability and cost, but it also has a style that is best suited to more rustic kitchens. Finally, since a spice rack is going to be seen throughout your home, you really need a style that resonates with the rest of your kitchen. A modern spice rack suits a modern counter, while a cozy country kitchen is going to need a different style entirely. All of these things form the basis for the “best spice rack” and mean that choosing a spice rack is a very personal experience. The best spice rack for you and your kitchen is going to depend on the type of cooking you do. There are a lot of spice racks, because there are a lot of options. What does a spice rack mean to you? Is it something you affix to your wall, or have on your counter? We’ve created a complete list of the best options. What we love: Bright white, clean and modern, the YouCopia Chef’s Edition organizes up to 30 standard full-size bottles (or 60 standard half-sized bottles) into easy, pull-out drawers. We love the fact that the drawers drop down when you pull them out, so you can view all of the spices in the drawer quickly. 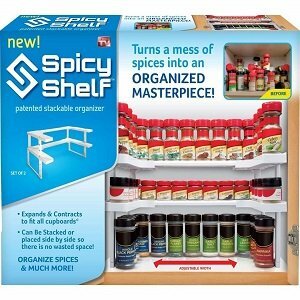 This is an incredibly unique spice organizer that can fit into a rather compact space. Developed with three drawers which fit 30 standard bottles or 60 half-sized bottles, this SpiceStack lets you pull out your spices to use them. Drawers slide and then drop down so you can view them easily, and they slide right back in so there’s no fuss when you’re cooking. Any standard size of bottle can fit into the SpiceStack, which also comes with labels that are used to create a uniform organizing system. The YouCopia Chef’s Edition SpiceStack can be dropped into a cabinet or placed on a counter without any screws, glue or tape, and the bright white finish makes it suitable for just about any decor. The SpiceStack should fit into most regular cabinets, as long as the cabinet is 11″ deep and 13″ wide at minimum. It also works well on the side of a counter. The only downside is that you can’t look at your spices at-a-glance and you can’t display your spices: they’re out of sight, out of mind. What we love:If you want an affordable, in-cabinet spice rack, the Spicy Shelf is the best option for you. We love how the Spicy Shelf just snaps into a cabinet, immediately organizing spices along the interior. Fitting directly into a cabinet, this organizer comes with special extensions for the perfect fit each time. The Spicy Shelf creates a “stadium style” shelf that wraps around the interior of the cabinet, installing without any tools and keeping all of your spices well-organized. It can fit into most standard cabinets, but is best suited to standard cabinets of about 13″ to 11″. With multiple rows, it’s able to organize a large volume of spices into their separate shelves. Spices are all easily viewed when you open your cabinet, so you can quickly find the things you need: and because all of your spices are hidden away inside of the cabinet, you don’t need to worry about any unsightly bottles. As a bonus, this cabinet can also be used for other things: it’s extremely versatile. The only downside is that it can eat up some of your cabinet’s interior footprint: in order to use the spice rack effectively, you do need to keep most of the cabinet empty. What we love: A great countertop solution, the Spectrum Diversified countertop spice rack has a total of three tiers to maximize its organizational space. We love that this spice rack can be installed on a counter, in a cabinet or on the wall, depending on the type of spice rack you’re most interested in. With an elegant black metal design and included mounting hardware, the Spectrum Diversified Countertop 3-Tier Spice Rack is probably the best option for those who want a no fuss installation. This rack can be placed inside of cabinets or mounted to the wall, and can handle a total of three rows of different types of spice bottles. It’s a fast, easy way to organize your spices now. The intricate black metal design of the Spectrum Countertop spice rack makes it fit into virtually any decor, but it can also be hidden away inside of a cabinet if you choose. Since it can be installed on the counter, in cabinet, or on the wall (with the included mounting hardware), it’s one of the most versatile options. However, because of its attractive appearance (and ability to organize spices into a compact format), it’s really best suited to the counter. What we love:Want a spice rack that’s also a statement? 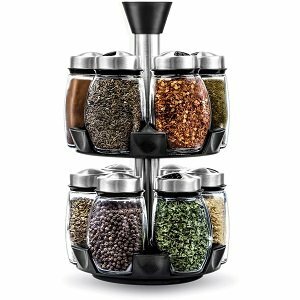 The 12-Jar Revolving Spice Rack Organizer is an attractive, stainless steel finish organizer that rotates for easier use. With 12 included jars, you’re able to create a consistent look for all of your spices. We love that this spice rack is beautiful and elegant, with consistent bottles that can be refilled. However, its size is a real sticking point. A sleek, modern design, the 12-Jar Revolving Spice Rack organizer makes it easier for you to access all of the spices that you need. 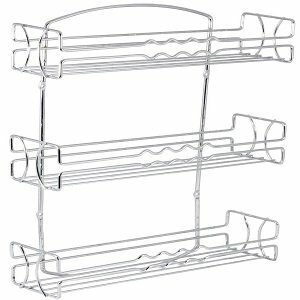 You can place this organizer in the corner of a kitchen counter and you’ll still be able to get any spice from the back. With a smaller footprint, it’s even better for smaller kitchens or kitchens that don’t have a lot of counter space. And its attractive design also makes it a style and a conversation piece. 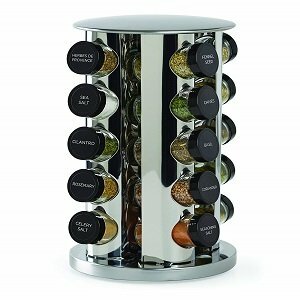 You can quickly get the seasonings you need by turning the carousel, which can also fit inside of any standard cabinet. 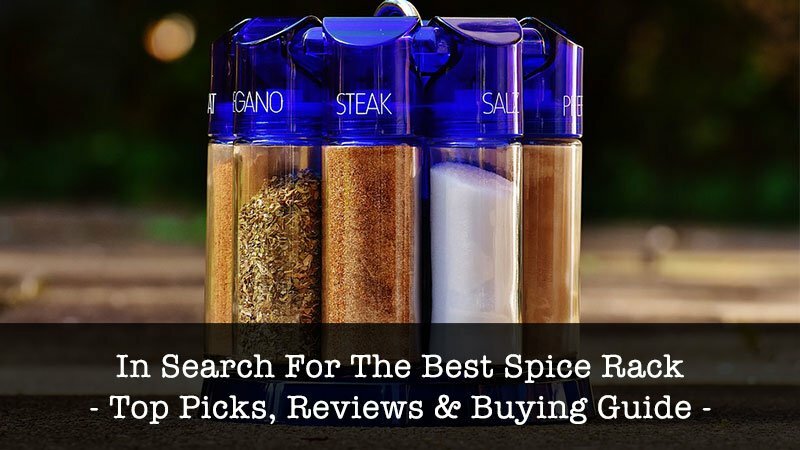 With multiple tiers, the spice rack organizer can be used to organize more than just a few bottles of spices, and the smooth turning of the carousel makes it very easy to use. A stainless steel finish also elevates it to decor for most kitchens. If you want consistency in your spices, this revolving spice rack also comes with metallic finish jars, which can keep your spices organized and fit perfectly within the organizer. The large, glass bottles of the jars make it so that it’s easy to identify the spices and see when you’re getting low, though the set doesn’t come with the spices themselves. The only downside to this rack? It only fits 12 spices: not enough for most kitchens. 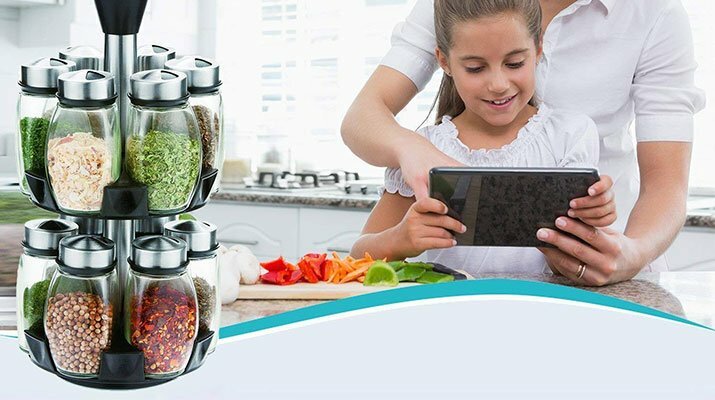 What we love: The Kamenstein Revolving 20-Jar Countertop Spice Rack is a unique all-in-one solution, which already comes with 20 pre-filled jars of spices, and also has a program for free spice refills for up to five years. We love that the Kamenstein handles all of your spice needs for you, especially for those just setting up their kitchen. 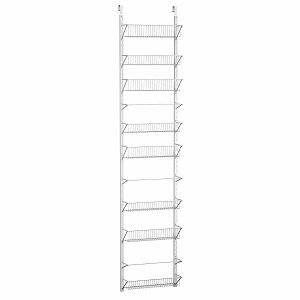 If you’ve got a ton of spices to deal with, you need the spice rack tower organizer. 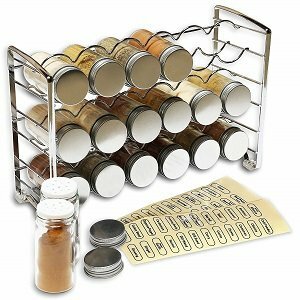 The revolving 20-Jar organizer is a large scale organizer that gives you everything you need, including the spices: when you buy the Kamenstein, you also get a full five years of free spice refills. 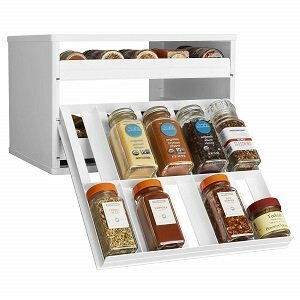 This organizer is built vertically, so you’re able to store a lot of spices in a small amount of counter space. Not only do you get an attractive organizer, but you also get 20 spices, which are packed for freshness and include standards like garlic salt, rosemary and basil. The revolving display means you can quickly look at the spices you have and find the spices that you need, while also not devoting a lot of shelf space or counter space to your spices. Since the spices are on their side, you can also standardize the labels on the caps to quickly see what you need. Also, you don’t need to use the pre-fill spices: since the bottles are all included, you’re free to fill them up with different brands of spices, so that you always have exactly what you need. Now there is a downside: you are paying for the spice “refill” program, and reviews of the spices themselves are a bit lackluster. Further, though it’s “free spices,” that’s a bit misleading: you still need to pay shipping, which for some of the cheaper spices, can be more expensive than just buying them. What we love:The Neu Home Over the Door 6 Basket Hanging Storage Unit provides a significant amount of additional storage over any standard door, without any special installation process: just hang it over the door and you’re all set. We love how much storage this adds, especially for serious cooks. A large, over-the-door hanging storage unit, the Neu Home has enough storage for more than just spices. If you have large amounts of spices and other kitchen items to organize, the Neu Home is the perfect solution for you. As an over the door storage unit, it can fit on a kitchen door, pantry door or any other standard-sized door, adding a significant amount of shelf-space and utility. This storage organizer isn’t just used for spices, it can also be used to organize bathrooms, garages, and more. Due to its size, it’s ideal for those who have larger collections of spice. By hanging over the door, it doesn’t use up any existing space: you don’t need to give up counter or cabinet space to use this. And, because of its attractive metal design, it can also be an accent pieces. However, it is very large for those who aren’t organizing multiple things in their kitchen, and for those who do a lot of cooking, it may be overkill for a spice rack. What we love:The DecaBros Spice Rack Stand Holder is well-suited to any kitchen counter, with chrome finish and 18 bottles that you can use to organize your existing spice collection. We love its minimalist aesthetic, which lets it fit into any kitchen. With 18 included spice bottles, the DecaBros chrome-finished spice rack is an attractive all-in-one solution to all of your spice problems. Just fill with your 18 favorite spices and use the included spice labels to create the spice rack of your dreams. 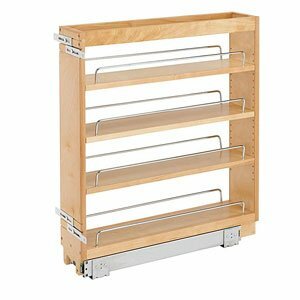 As a standing spice rack, the DecaBros can be placed inside a cabinet or on a counter. The DecaBros stand holds spices so you can see them top first, creating an attractive appearance and making it so that you can easily organize your spices by label. You will need to decant all of your spices into the DecaBros bottles for the stand holder to work effectively, though, and you can only hold up to 18 spice jars. It’s also not suitable for half-sized jars. What we love:If you want a built-in, pull out spice rack, the Rev-a-Shelf is for you. 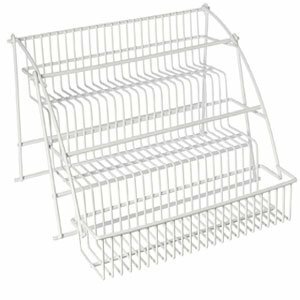 We love how easy this cabinet organizer is to install, in addition to the modern feel that it gives any kitchen. This wood cabinet organizer will fit into an existing cabinet, with mounting hardware that allows the cabinet to easily pull down for access. One of the easiest to use options, this spice rack has a lot to adore: it gives you a lot of shelf space and utility while still being easy to use and easy to mount. It can be used with any standard base cabinet. The Rev-a-Shelf is a little more expensive than many other options, but it’s essentially built-in storage: it adds value to your kitchen. You also don’t need a lot of knowledge to install it, which makes it a nifty upgrade for someone who cooks a lot. What we love: A unique and efficient design, the Rubbermaid Pull Down Spice Rack bolts into the floor of your cabinet and then pulls out and down any time you need to access your kitchen spices. We love how convenient this is when cooking. If you want an affordable pull down solution, Rubbermaid has an option for you. 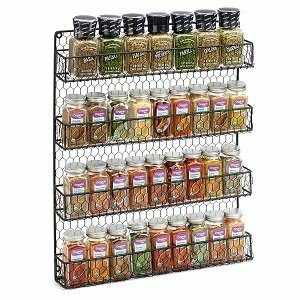 The Rubbermaid pull down spice rack is an affordable spice rack that bolts directly into the bottom of your cabinet. With a tiered design, it gives you the ability to see all of your spices at once, while also letting you pull the entire rack up and down while cooking for easier access. Everything you need to install this into your kitchen is right there with it, the only downside is that it is a fairly small spice rack and it does take up room in your cabinet: even though it pulls down, it’s going to take up the center of your cabinet regardless. Consider pairing it with something like the Spicy Shelf in a larger cabinet to take advantage of all the room. What we love: If you want a simple, direct wall mount spice rack, the DecoBros 3 Tier Wall Mounted Spice Rack is the best solution. Its chrome finish makes it well-suited to many kitchens and it can be filled with standard spice bottles. We love how versatile this option is. The DecoBros are back, this time with an attractive wall-mount spice rack that has three tiers of organizational space. 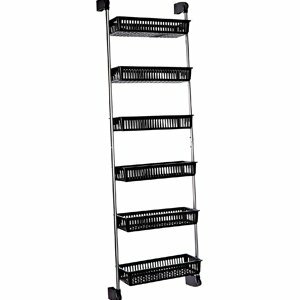 With durable, attractive metal construction and a universal chrome finish, the DecoBros 3 tier wall mounted rack lets you look at all of your spices at a glance. Mounting hardware is included for any wall, but the spice jars aren’t included. If you have tons of spices already in your collection, the DecoBros mounted spice rack offers a minimalist, fast and (above all) budget way to organize your kitchen spice collection. It’s also versatile enough to be used for other things, such as bathrooms. What we love:Want a spice rack that has a bit of style? This Rustic Chicken Wire Spice Rack is a four tier, wall mount spice rack that offers an exceptional amount of space. We love the unique design, which delivers a lot of personality. Keep your spices off the counter with the Rustic Chicken Wire Spice Rack, which can hold up to four tiers of spices in a wall-mounted format. Rather than having to devote counter and cabinet space to your spices, you can just store them along the wall. Perfect for displaying particularly attractive selections of spices. What’s really special about this spice rack is the design, which is a quaint, classic spin on a sort of rustic kitchen. 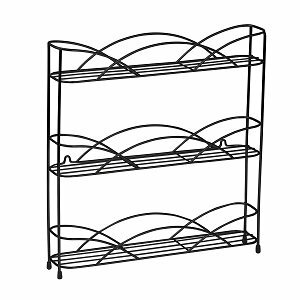 Many spice organizers have a fairly generic look so they can fit into most kitchens, but this spice rack is the exception. This easily mounted spice rack is durable and versatile enough to be used in other rooms of the home as well, such as in bathrooms. What we love:If you want a simple solution, it’s hard to beat SimpleHouseware. A strip of grips, the SimpleHouseware spice rack is an adhesive strip that fits along any wall, letting you slide the spices directly into them. We love how innovative this solution is. 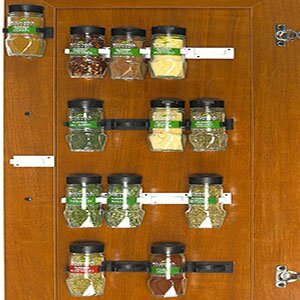 Unlike nearly any other type of spice organizer, the SimpleHouseware spice rack is an adhesive strip that gets attached directly to the interior of a cabinet or to the wall. From there, the grips attached to the strip can be used to hold your spices for display. With the SimpleHouseware kit you get multiple black and white strips, and these strips can be cut to size. 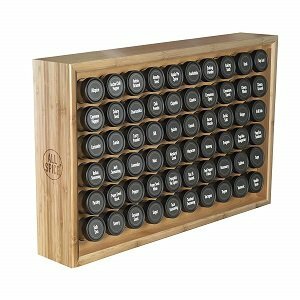 If you really want to put your spices at the forefront of the focus, this is the perfect organizer: but it can be a little distracting for those who are looking for elegance. It can also only be used for standard spice bottles. What we love:A solid bamboo frame elevates this contemporary spice rack, which provides for attractive, easy storage of up to 60 large bottles of spices. This AllSpice Wooden Spice Rack is attractive addition to any kitchen, and we love that it comes with a large inventory of pre-printed labels. You can organize all of your spices at once with the AllSpice Wooden Spice Rack, which comes complete with 60 large glass jars and pre-printd labels for nearly any type of spice or seasoning you can imagine. A high capacity rack, it’s designed to hold as many spices as is possible within a small format, making it a great piece for those who have a large spice collection. In addition to bottles, it includes tops for them: large hole shakers, small hole shakers, and spoon tops. Not only will your spices be organized, but they’ll also be easy to use. What we love:This futuristic organizer just snaps onto any magnetic surface, including your refrigerator. The magnetic spice rack is a series of magnetic containers that you fill with your spices, organizing them along the side of an appliance. We love how creative and easy to use this is. Use the power of magnetism to organize your spice cabinet. 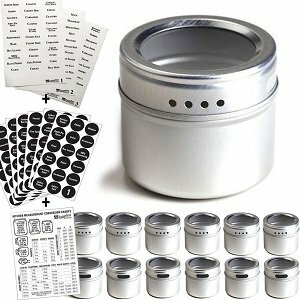 These magnetic spice tins can be filled with the spices in your kitchen, which can then be placed on any magnetic surface: usually your refrigerator. By using vertical wall space, you’re able to save room in your actual kitchen, while still organizing your spices in a consistent way. You’ll get a total of 12 tins with this set, but you can add as many tins as you want, and there are also pre-printed labels available. A magnetic spice rack lets you organize your spices on-the-fly, see your spices quickly, and make sure you save as much counter space as possible. The only downside is that the tins do require a magnetic surface and they only hold 3 ounces at a time. What we love:A space saver, the Home Complete Pantry creates organizational space on any standard door. Perfect for a kitchen or pantry door, either inside or outside of the door, the Over the Door Spice Rack has a total of eight shelves for organizational power. We love that it’s adjustable to suit your needs and has so much storage space. If you want a lot of storage space in your kitchen, consider the Home Complete Pantry Over the Door Spice and Jar Rack Organizer. It can be used for more than just spices and jars: you can also add condiments cereal boxes, and more, due to its size. This organizer is a versatile way to add storage space to any kitchen, and there’s no special tools that you need with installation: just hook it over the door, add some mount screws, and you’re set. That’s a list of the most durable, attractive, convenient and efficient spice organizers we could find. For more, check out the Cooking Detective.